^ 1.0 1.1 CIA Factbook. Central Intelligence Agency (CIA). [2018-11-15]. 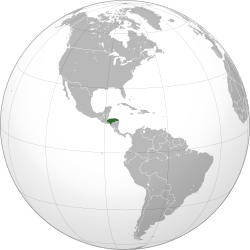 ^ 3.0 3.1 3.2 3.3 Honduras. World Economic Outlook Database. International Monetary Fund (IMF). April 2016 [2016-06-11]. ^ World Population Prospects: The 2015 Revision. 聯合國經濟和社會事務部. 2015. （原始内容存档于6 May 2011）. ^ 14.0 14.1 The World Factbook — Central Intelligence Agency. www.cia.gov. [2017-11-26] （英语）. ^ 15.0 15.1 15.2 15.3 15.4 15.5 Human Development Report 2016: Human Development for Everyone (PDF). ^ U.S. Relations With Honduras. United States Department of State. 9 April 2015 [9 February 2016]. ^ American Fact Finder: Allocation of Hispanic or Latino Origin. United States Census Bureau. [7 February 2016]. ^ Honduran National Institute of Statistics 互联网档案馆的存檔，存档日期2010-10-17. ^ 存档副本 (PDF). [2009-10-15]. （原始内容 (PDF)存档于2009-11-13）. ^ Human Development Report 2009 – Honduras. Hdrstats.undp.org. [27 June 2010]. （原始内容存档于29 April 2009）. ^ Hondureños bilingües tendrán más ventajas [Bilingual Hondurans have more advantages]. LaPrensa. 14 October 2009 [9 February 2016] （西班牙语）. ^ Bunson, Matthew E.; Min, D. Catholic Almanac. Huntington, Ind. : Sunday Visitor Publishing. 4 November 2015: 312–13. ISBN 978-1612789446. ^ 25.0 25.1 25.2 25.3 Honduras Travel Warning. Travel.State.Gov. U.S. State Department. [17 August 2016]. （原始内容存档于2017-11-24）.